Study Hall at the recently enlarged Tomales High School, 1923. Our exhibits are designed to inspire familiarity and a connection with the Shoreline Region’s past. For us, that past is with us every day; the more we pore over historical images and artifacts, the more we sense its living presence in our surroundings. The resources on this page provide additional context for the exhibits. We hope they spark curiosity and understanding about the past and its relationship to the present. A toy goat cart, made of iron with still-functioning wheels, found buried in Tomales. Only a small portion of our Collection is on display in the museum at any given time. There is, of course, much, much more in our archival storage room. Our goal is to have the entire collection digitized, with each item virtually accessible, its description, provenance, condition, and storage place recorded, along with at least one good photographic image. This is a long-term goal to be sure. In the meantime, our digital catalog, albeit currently incomplete, is slowly growing, and always available to visitors at the museum. Items for the Collection are acquired primarily by donation. Especially as our collection grows, it is important that each new item adds to our knowledge and "sense of place" of the Shoreline Region, and that we have the ability to preserve, exhibit, and interpret it properly. Our Collection Policy has recently been amended to include language that encourages these concerns. If you have an item you wish to offer for donation, especially if it is larger than a few photographs — which, if relevant to the area, we are always willing to accept — please contact the Curator, Ginny Magan. You may contact her directly at ginnymac@sonic.net or use the form on our Contact page. She will be happy to answer questions about our policy and explain the procedure and conditions of acquisition. This New Year edition of the quarterly was inspired in large part by the disastrous fires in our neighboring Sonoma County a few months earlier. The issue’s theme of “Change, Recovery, and Adaptation” is a common one across all of history, and the issue explores the cycles, large and small, of local change and recovery, from well before settlement to today. In the History Center’s 40th year, we are both remembering our beginning and considering our progress. This introspective Bulletin issue examines the organization’s Mission Statement, with words and pictures. 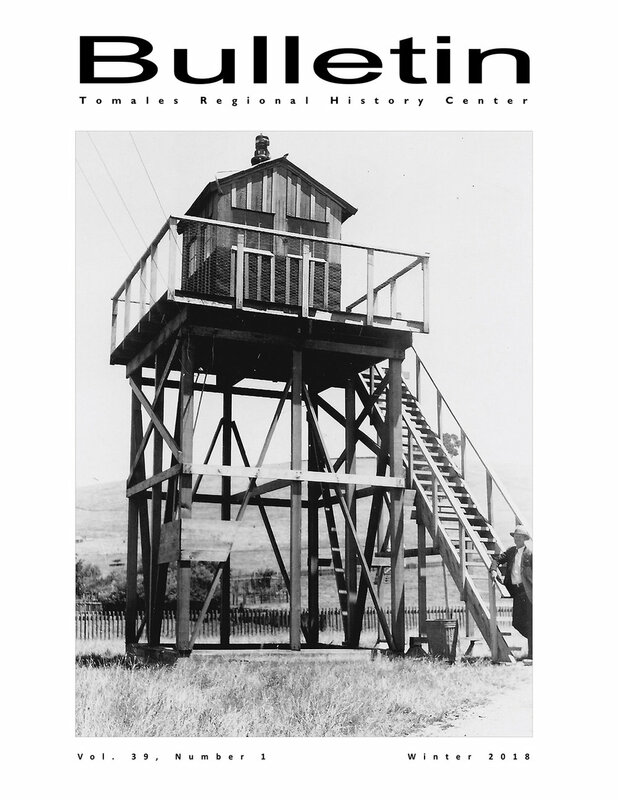 There is also a short piece about native son A. Bray Dickinson (1890 ̶ 1958), a local historian from whom we have learned much about the narrow gauge railroad and the village of Tomales. The Bulletin is TRHC’s quarterly publication, mailed to our members in January, April, July, and October. Each issue includes stories and insights about the region’s past, illustrated with archival images from our large collection. Each issue also keeps readers up to date on the organization’s plans and activities — our presentations, exhibitions, and other events, and the latest acquisitions to our Collection. We hope that you enjoy the sample issues posted above (PDFs). Click the image to open/download. Interior of the Fallon Creamery, one of the region’s largest creamery operations, with owners, workers, and probably some family members, circa 1900. Our museum includes a small bookstore, primarily intended as a convenience to our neighbors and visitors. It’s a place to purchase hard-to-find publications relevant to the local region, often works from local authors and publishers. Our stock is small, and occasionally includes books with limited publication. There is, however, always something of interest to local history enthusiasts. As a small, all-volunteer organization, and because of this somewhat unpredictable stock, we are unable to accept orders for books online. 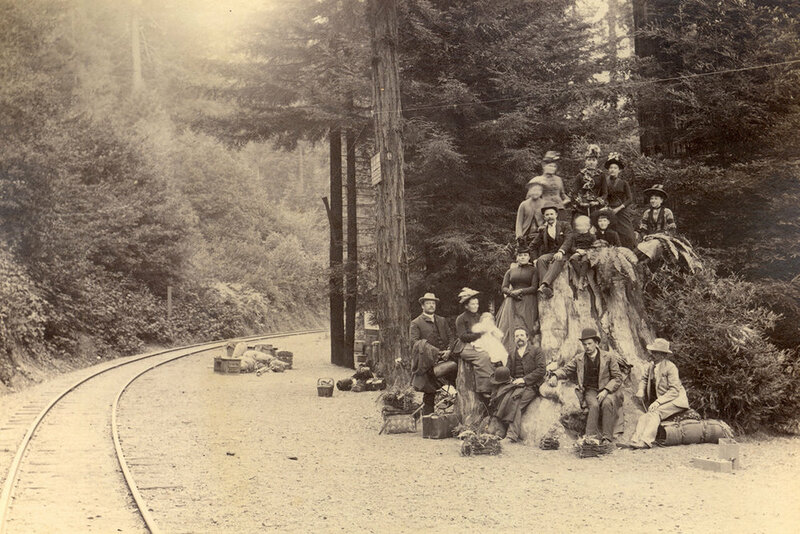 Picnickers waiting for train pose near Lagunitas Creek on and around a tree stump, circa early 20th century. This list of links includes a range of online resources relevant to local history that we occasionally use in our research and think might be of interest to our visitors as well.